We have recently published a post about pallet entryway wooden flooring! Here we are with the 2nd part in which we’ll try to cover up more details! 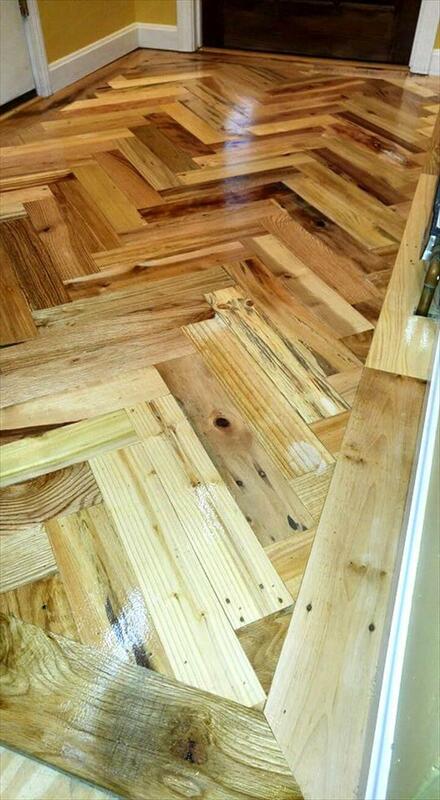 Wood flooring projects with pallets, all require the precision very first! To bring precision to your work, you should go for accurate measurements, sharp and clean cuttings and mostly importantly you should use the leveling tools for a balanced wood floor! 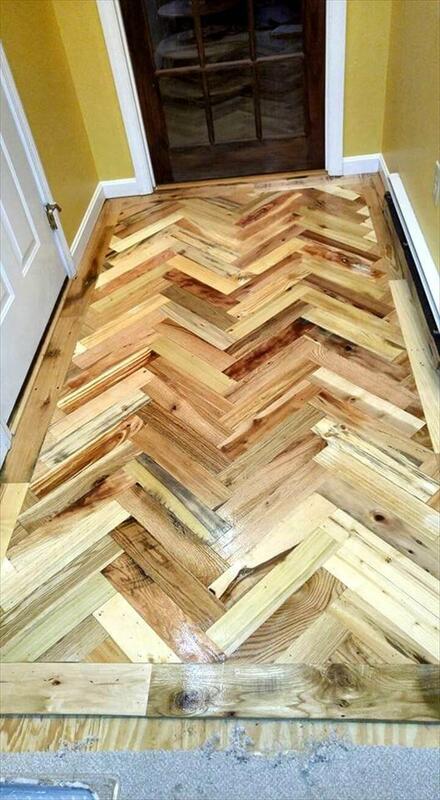 This DIY entryway chevron pallet floor would be more precision-taking as you are not only here to fill up the area with pallet slats like a puzzle game but you have to go for stylish filling of pallet slats to form eye-catching chevron pattern! Installing wood floors is a damn cool way to insulate particular room interiors or for a dwelling as a whole! 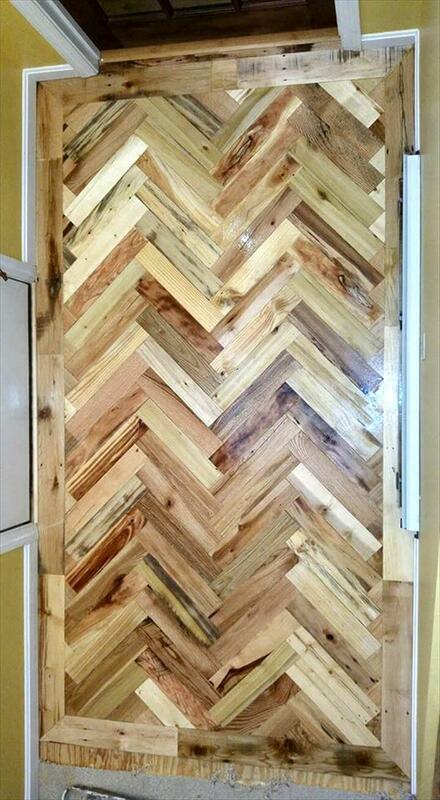 Just like this wooden flooring project, one can also do amazing wood wall paneling projects with pallets! Here is how one can fancy up his dwelling with pallets by just improving its interiors with pallets! Wooden flooring is one of the luxurious trends and it also costs you too much but going with pallet the total cost would be equal to nothing! Starting from a mini rectangle is the key point here for better and precise chevron pallet flooring! Don’t forget to apply the finishing wood coats that bring shine and lot of protection to wood grains! 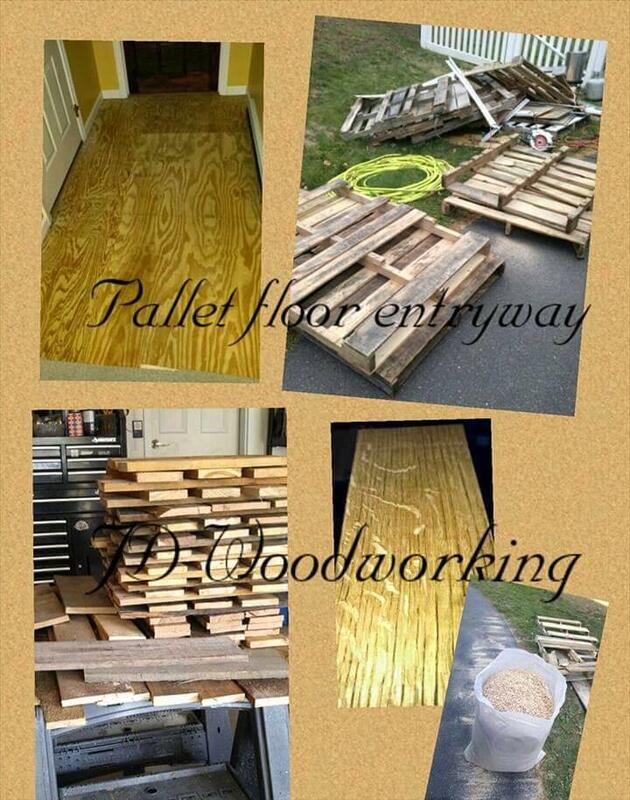 Here is the visual presentation of basic steps and pallet projects details!